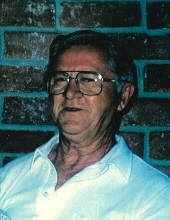 Edward Conley Goodman, age 96, resident of Norman, Oklahoma, passed away February 6,2019, at Noble Nursing Home. A celebration of his life will be held at 2:30 p.m., February 9, 2019 at the Trout Funeral Home Chapel with Rev. Tom Howard officiating. He will be lade to rest at the Odd Fellows Cemetery in Ponca City, on Monday at 10 a.m. Arrangements are under the direction of Trout Funeral Home & Crematory. Edward was born on February 1, 1923 to Rufus Lynn and Ida Marie (Conley) Goodman in Chandler, OK. He graduated from Chandler High School in 1941and hitch hiked to Ponca City. Edward joined the Army Air Corp and served for 2 years. He worked on airplanes at Darr School of Aeronautics. He was married to Ernestine Gail Young on July 31, 1943 and moved to Miami, OK. Returning to Ponca City to work for Conoco refinery in the Control Lab. Edward was an avid golfer, he has played 36 golf courses in Oklahoma. He played in ten different states. He loved to go to the casinos. He was a member of the First Baptist Church in Ponca City, OK. He was a member of the Elks Club in Ponca. He enjoyed visiting with good friends there every week. He loved music especially Kansas City and "San Antone Rose". In later years he would start singing Kansas City and doing his "jig" to anyone who would listen; store employees, doctors offices, friends, etc. He and his wonderful wife were always the first ones to get up and dance. Family was very important to him and he was always available when needed. Left to cherish his memory: two daughters Gail & Debbie, four grandchildren Todd, Ryan, Tyler, Whitney, twelve great grandchildren Blake, Aubree, Hunter, Egan, Ophelia, Sophia, Emma Grace, Austin, Claire, Eli, Mary, Devon. To send flowers or a remembrance gift to the family of Edward Goodman, please visit our Tribute Store. "Email Address" would like to share the life celebration of Edward Goodman. Click on the "link" to go to share a favorite memory or leave a condolence message for the family.